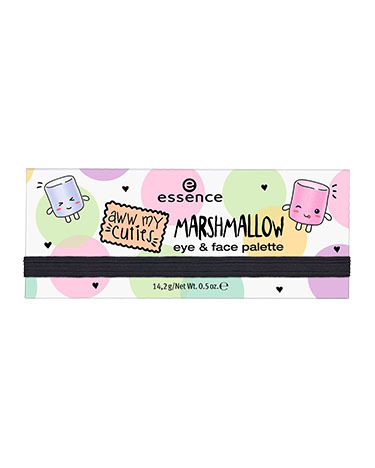 aww my cuties marshmallow eye & face palette has a rating of 3.0 stars based on 1 reviews. EYESHADOW INGREDIENTS: TALC, MICA, MAGNESIUM STEARATE, DIMETHICONE, ETHYLHEXYL PALMITATE, POLYISOBUTENE, SYNTHETIC WAX, CAPRYLIC/CAPRIC TRIGLYCERIDE, PARAFFINUM LIQUIDUM (MINERAL OIL), TIN OXIDE, DIETHYLHEXYL SYRINGYLIDENEMALONATE, ETHYLHEXYLGLYCERIN, BHT, BUTYL METHOXYDIBENZOYLMETHANE, ETHYLHEXYL METHOXYCINNAMATE, PHENOXYETHANOL, MAY CONTAIN/[+/-]: CI 19140 (YELLOW 5 LAKE), CI 42090 (BLUE 1 LAKE), CI 75470 (CARMINE), CI 77007 (ULTRAMARINES), CI 77491, CI 77492, CI 77499 (IRON OXIDES), CI 77891 (TITANIUM DIOXIDE). INGREDIENTS: MICA, TALC, MAGNESIUM STEARATE, DIMETHICONE, ETHYLHEXYL PALMITATE, POLYISOBUTENE, SYNTHETIC WAX, CAPRYLIC/CAPRIC TRIGLYCERIDE, PARAFFINUM LIQUIDUM (MINERAL OIL), TIN OXIDE, DIETHYLHEXYL SYRINGYLIDENEMALONATE, ETHYLHEXYLGLYCERIN, BHT, BUTYL METHOXYDIBENZOYLMETHANE, ETHYLHEXYL METHOXYCINNAMATE, PHENOXYETHANOL, CI 19140 (YELLOW 5 LAKE), CI 77491, CI 77492, CI 77499 (IRON OXIDES), CI 77891 (TITANIUM DIOXIDE). INGREDIENTS: MICA, TALC, MAGNESIUM STEARATE, SYNTHETIC FLUORPHLOGOPITE, DIMETHICONE, ETHYLHEXYL PALMITATE, POLYISOBUTENE, SYNTHETIC WAX, CAPRYLIC/CAPRIC TRIGLYCERIDE, PARAFFINUM LIQUIDUM (MINERAL OIL), TIN OXIDE, DIETHYLHEXYL SYRINGYLIDENEMALONATE, ETHYLHEXYLGLYCERIN, BHT, BUTYL METHOXYDIBENZOYLMETHANE, ETHYLHEXYL METHOXYCINNAMATE, PHENOXYETHANOL, CI 75470 (CARMINE), CI 77007 (ULTRAMARINES), CI 77891 (TITANIUM DIOXIDE). HIGHLIGHTER INGREDIENTS: MICA, TALC, MAGNESIUM STEARATE, DIMETHICONE, ETHYLHEXYL PALMITATE, POLYISOBUTENE, SYNTHETIC WAX, CAPRYLIC/CAPRIC TRIGLYCERIDE, PARAFFINUM LIQUIDUM (MINERAL OIL), TIN OXIDE, DIETHYLHEXYL SYRINGYLIDENEMALONATE, ETHYLHEXYLGLYCERIN, BHT, BUTYL METHOXYDIBENZOYLMETHANE, ETHYLHEXYL METHOXYCINNAMATE, PHENOXYETHANOL, CI 77491, CI 77492, CI 77499 (IRON OXIDES), CI 77891 (TITANIUM DIOXIDE). BLUSH INGREDIENTS: TALC, MICA, MAGNESIUM STEARATE, DIMETHICONE, ETHYLHEXYL PALMITATE, POLYISOBUTENE, SYNTHETIC WAX, CAPRYLIC/CAPRIC TRIGLYCERIDE, PARAFFINUM LIQUIDUM (MINERAL OIL), DIETHYLHEXYL SYRINGYLIDENEMALONATE, ETHYLHEXYLGLYCERIN, BHT, BUTYL METHOXYDIBENZOYLMETHANE, ETHYLHEXYL METHOXYCINNAMATE, PHENOXYETHANOL, CI 15850 (RED 7 LAKE), CI 77491, CI 77492, CI 77499 (IRON OXIDES), CI 77891 (TITANIUM DIOXIDE)."